An engaging set of light up resources, perfect for enhancing your sensory ICT range. 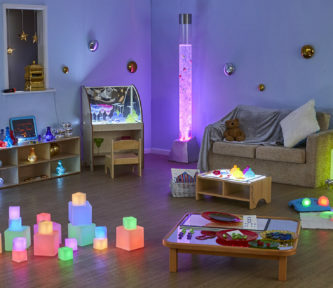 Inspire awe and wonder by selecting a colour for each light up resource and creating a beautiful sensory area. Inspire nervous writers with our Illuminated Writing Boards. Create a variety of colour sequences with our assorted sizes Glow Pebbles. Stack, roll and shake the Glow Rollers. Choose from an assortment of colours or set to a sequence mode. The resources are beautiful when used in a Dark Den or sensory room. They offer a range of learning opportunities, such as developing mathematical literacy, exploring cause and effect, or enhancing a construction area.